Do Routine Postoperative Upper Gastrointestinal Studies Following Laparoscopic Gastric Bypass Affect Clinical Outcomes? a Community Hospital Experience. INTRODUCTION: Many institutions routinely perform upper gastrointestinal studies (UGIS) following laparoscopic Roux-en-Y gastric bypass (LRYGBP) for the potential advantage of early identification of anastomotic complications. Alternatively, UGIS may be used selectively, if early post-operative anastomotic complications are suspected. Intraoperative air leak test may be used solely or in conjunction with UGIS to rule out an anastomotic leak. METHODS: A retrospective chart review of 75 LRYGB cases was performed at our institution from January 2009 to July 2010. In 55 cases an UGIS was performed routinely on post operative day one (group 1). In 20 cases an intraoperative air leak test was performed to rule out any leak and a postoperative UGIS was only obtained selectively in the presence of clinical indicators (group 2). RESULTS: A postoperative UGI study was obtained in 58 patients (55 patients from group 1 and 3 patients from group 2). No obstructions or leaks were found in any of those 58 patients. 17 Patients were discharged without an UGIS and did well without any leak or obstruction. 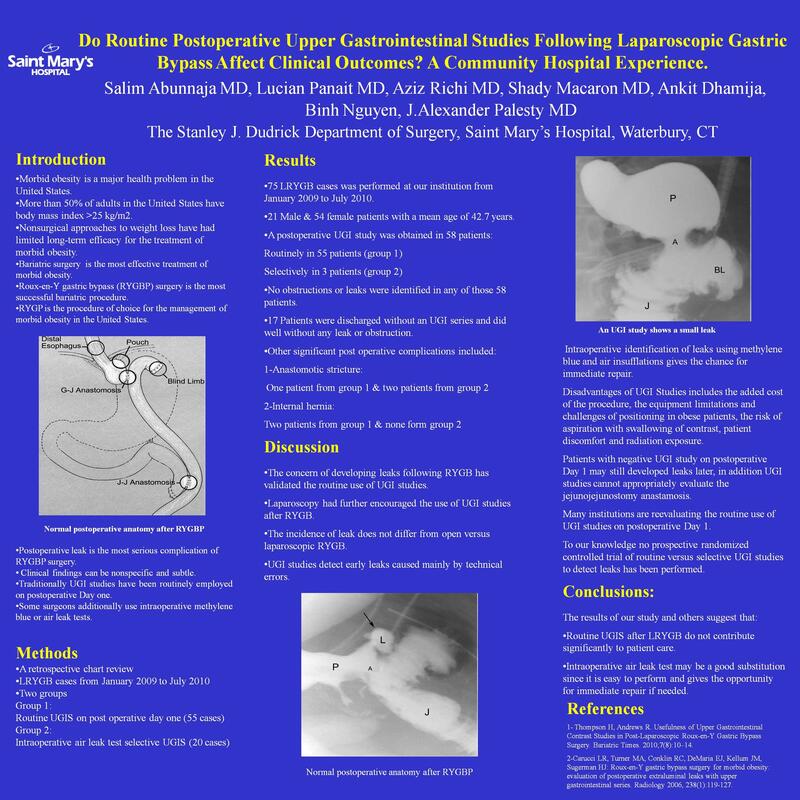 Post operative complications included anastomotic stricture (1 patient from group 1, and 2 from group 2) and internal hernia (2 patients from group 1). No statistical significant differences were found between the 2 groups. CONCLUSION(S): The results of our study suggest that routine UGIS after LRYGB do not contribute significantly to patient care. Intraoperative air leak test may be a good substitution since it is cheap, easy to perform and gives the opportunity to repair any detected leak at the initial operation.